Zirconium is a chemical elemental metal. It is a greyish-white in color. It is atomic number 40 on the periodic table. Its symbol is Zr. And it is in the family of four (4). 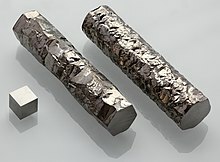 Zirconium alloys are used as cladding for nuclear fuel rods. This page was last changed on 18 August 2018, at 01:17.